Bespoke Arcades are proud to present an exclusive collection of the highest quality arcade machines known to man. 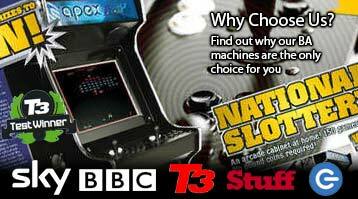 All of our arcade machines for sale are exceptionally designed and expertly custom-built to order at our UK workshop. Established in 2005, we are considered the market leader with our arcade cabinets available to buy directly from our factory store or via the world’s finest shops like Selfridges and Harrods amongst others. Our high-end games machines are also used for promotions by the likes of Capcom, Warner Bros and 2K Games so when you buy from us you know that you are getting the best. At Bespoke Arcades, you have a choice of four great in-house arcade machines depending on your preferred model: Apex classic stand-up, Synergy arcade table, Evo widescreen stand-up or Nu-Gen modern sit-at arcade. Our main aim is to help you tailor your chosen arcade machine to your exact wants so all products come in Play, Media or Elite editions which can be perfected with an array of customisations. All cabinets come with access to over 10000 retro games as standard and have the ability to play many 1000’s more games from every retro gaming era imaginable. As the world’s leading producer of high-end arcade cabinets, we have an extensive list of satisfied clients including many well-known celebrities/companies who all testify as to their quality and reliability. When buying from Bespoke Arcades, you can rest assured that you’ve made the right choice and will be well looked after for many years to come. We can ship to your door across the globe and if you have questions about our products or would like some direct pricing please don’t hesitate to mail or call us on +44 (0)207 935 9005 anytime. We simply love to showcase our arcade machines to everyone who wants to see them and try to be an ever-present at the major game/gadget exhibitions such as Eurogamer, Gadget Show Live and Gamescom. Let us know if you’re visiting a show and we’ll take the time to go through all the features during one of our select events. As the leading producer of luxury custom arcade machines, our products are quite simply the best around. All our retro arcade cabinets have received terrific reviews from numerous authorities and great plaudits from respected media outlets. These include the Gadget Show, the BBC, ITV, SKY, FHM, Men’s Health, Stuff, Maxim + many others. We’ve produced fully bespoke arcade machines for sale since 2005 and have long been considered the market leader in this field. This is further backed up by the fact that we have the pleasure to be tasked to work on superb projects with best-in industry companies such as the likes of Warner Bros, Capcom and 2K Games to name but a few. You can buy arcade machines directly via our factory store or we are happy to welcome you to visit our showroom by appointment to see our products in action and help you to make the decision. 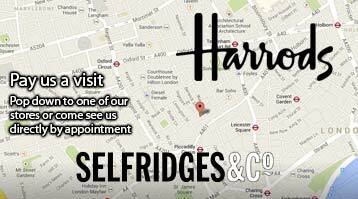 All of our arcade machines are also on sale at the most prestigious stores in the world including Selfridges and Harrods.